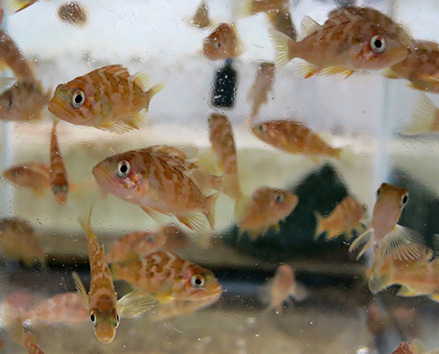 A new paper in the journal PLOS One shows that some species of juvenile rockfish find it harder to exert themselves in acidified seawater, but other species are more adaptable. The study used a variety of methods to measure the fishes’ behavior, physiology, and genomic responses to ocean acidification. The experiments for this paper were conducted in MBARI’s state-of-the-art seawater laboratory, which allows researchers to control temperature, acidity, and oxygen content of seawater in which animals are raised for weeks or months at a time. In this case, the researchers changed the acidity of the seawater by regulating the amount of dissolved carbon dioxide in the water. Although the lab work was conducted at MBARI with support from Senior Scientist Jim Barry and Senior Research Technician Chris Lovera, the project involved researchers from a number of research institutions. Scott Hamilton, the lead author of the study, and Hamilton “Will” Fennie, who performed most of the lab work, are affiliated with Moss Landing Marine Laboratories (Fennie is now at Oregon State University). Cheryl Logan, who led the genomics portion of the study, is an assistant professor at California State University, Monterey Bay. Researchers from the University of California, Santa Cruz, and NOAA’s National Marine Fisheries Service also worked on the project. The researchers found that copper rockfish raised in water with high concentrations of carbon dioxide swam slower and had a harder time exerting themselves than those raised in “normal” seawater. Blue rockfish, however, showed no significant behavioral or physiological effects under the same conditions. “This could mean juvenile copper rockfish may find it harder to escape from predators and locate prey, and could reduce population sizes over time,” said Logan. 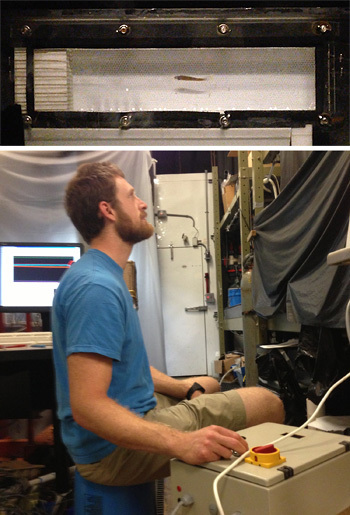 Upper photo: Juvenile rockfish in experimental flume. Lower photo: Moss Landing Marine Laboratories graduate student Will Fennie testing the swimming endurance of juvenile rockfish. Photos courtesy of Will Fennie. This experiment was unique in that the researchers were able to measure behavioral, physiological, and transcriptomic changes in the same individual animals. Transcriptomics allows biologists to figure out which genes are active in an organism at any given time. Unlike an organism’s genome, which remains relatively constant, a transcriptome may change over time in response to environmental conditions. The researchers suspect that the differences in sensitivity between species may be related to where these fish spend their formative months as juveniles. Although juveniles of both species live in the kelp beds, copper rockfish juveniles live close to the surface, where carbon dioxide levels in seawater may be reduced by exchange with the atmosphere or through photosynthesis by fast-growing kelp fronds. In contrast, juveniles of blue rockfish live closer to the seafloor, where carbon dioxide concentrations may be higher due to the accumulation of carbon dioxide from the respiration of animals near the seafloor. Seafloor areas may also be exposed to plumes of cold, carbon-dioxide-rich bottom water that are occasionally carried toward the coast by “upwelling” events. Because blue rockfish are exposed to higher carbon-dioxide levels as juveniles, the researchers hypothesized that they may be more tolerant of higher carbon dioxide conditions that could occur along the Central California coast over the coming decades. Juvenile rockfish are an essential part of coastal food webs, providing food for many seabirds, marine mammals, and other fishes. If some types of rockfish become more numerous and others disappear, this is likely to have ripple effects on other animals in Monterey Bay, as well as potentially negative effects on coastal fisheries and communities. New research systems like MBARI’s seawater lab are improving climate-change studies by providing more realistic environmental conditions. Such systems will help researchers tease out the effects of short-term environmental fluctuations, as well as the combined effects of increasing acidity, decreasing oxygen, and rising temperature, all of which may affect coastal waters over the next 50 to 100 years.